← Bristol missing teenage girl murdered – British Justice System on trial? Parliament’s Prime Minister’s Questions – time’s up? Even many of us who aren’t directly involved in politics know that there is a weekly session when the UK’s Prime Minister faces questions from the floor of the House. It has all changed over the decades of course, but it is these days televised so the general public get a horrifying visual glimpse of the performing MPs and the PM fending off attacks on the Government’s performance, any perceived failed policies and their personal leadership of course. It is doubtlessly a testing time for any Prime Minister, surely? In times gone by it was an opportunity for MPs of all persuasions to hold the government of the day to account, and even more mesmerising for everybody the possibility of someone to ambush the PM with a question they couldn’t handle – analogous to a cricket fast bowler pitching an unexpected bouncer at the batsman which gets them out. This Question session is these days a parody of all that though. It has become an opportunity for the six hundred and fifty MPs to become a baying mob and behave like drunken street yobs leaving a nightclub in the early hours of the morning. It has also become an opportunity for the Government to promote their case through planted questions, with the chance for supporting MPs to ‘pretend’ to ask questions but blatantly and unashamedly to simply congratulate those in power, whereas in turn any other opposition MP to have a valid question swatted away unanswered like an irritating fly – it is all just a sickening farce, don’t you think? 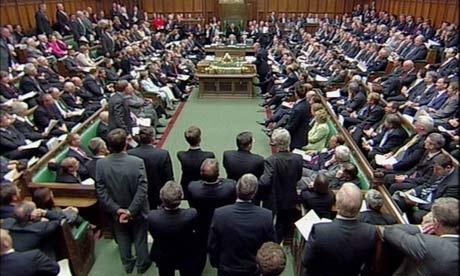 The TV coverage is cleverly obtuse with high level cameras strictly controlled & monitored to ensure discreet images only are transmitted, with smartly placed directional microphones using sophisticated digital filtering & manipulation, so that we don’t hear the real thing at all, or indeed overall do we see the MPs’ disgusting behaviour nor hear the shouting & excessive volume of noise that would be illegal in a factory environment, wouldn’t it? It wasn’t always like that though was it? No, it used to be civilized event, but all this disorderly behaviour by MPs first started, and has been increasingly going on since, because Wilson & Heath embarked on their personal animosity exchanges some forty years ago supported by their finatical followers. United Kingdom Prime Ministers have answered questions in our parliament for many-many centuries of course, but for the past couple it has been a bit more organised. These days though the PM is subjected to a half hour slot at midday on a Wednesday, in a House of Commons chamber attended by most MPs (many standing), eagerly watched from the limited numbers in the Public Gallery, and of course rigorously analyzed afterwards by the media. The Leader of the Opposition gets to ask six questions, and the third largest party’s leader, two questions, and Speaker selected MPs one each until time runs out. Every party leader when first elected promises to end the Punch & Judy show those parliamentary debates have become – but like everything else pontificated on; they are economical with the truth aren’t they? They do sod all to stop it. Prime Minister’s Questions (PMQs) have despite those facts now finally degenerated into a meaningless shambles, where the PM David Cameron rises again & again from his front bench seat and not only fails to answer any critical questions whatsoever, but is outrageous in his refusal to do so. Is he solely accountable? Definitely NOT. For a start his own MPs, who have all sought the support of their communities as upstanding people, and have been voted-in by them, should be utterly ashamed of such a leader and put a stop to his unacceptable behaviour. Then, we have to turn to the Speaker John Bercow who has been granted the great honour, matched with great authority, by all MPs to run the House of Commons’ fairly & judiciously, but who never ever admonishes PM David Cameron for not actually even ‘trying’ to answer questions. No, he is so busy week after week after week after week, telling the ‘out of control’ baying MPs from all sides that “the QUESTION WILL be heard and the ANSWER WILL be heard however LONG it takes” (it may actually be a recording though, don’t you think, as it is similar in repetitive type to tube & train announcements approaching stations?). He is nevertheless a marvellous threatener though – telling off specific (but unseen unnamed MPs) during some of the PMQs worst uproars (but never sending them packing of course). The current version of PMQs not only undermines democracy in this Country, but it also devalues politics, shows that our MPs are a powerless dysfunctional ‘party driven’ rabble, and makes a worldwide laughing stock of our Parliament. Time for it to go, surely? [PMQs has been progressively poisoned over time since the nineteen seventies, and is finally terminally sick and no Speaker has the skill or the cure. RIP]. This entry was posted in communications, community, cricket, Elections, establishment, government, media, personalities, political parties, Politics, Press. Bookmark the permalink.